Visually, the game is a call back to 8-bit retro pixelated graphics. This isn’t a bad thing at all. We are kind of starting to see a resurgence of call back games done with more modern hardware anyway, as oldschool fans definitely eat it up. There isn’t much more to say than this. The only thing I can do is show you some screenshots. Please don’t take the screenshots for granted. Seeing the game in action or giving it a try will give you a much better appreciation for the type of game Falling is. Your opponent is Wally the Walrus. At first he is just a minor obstacle in your quest to smash every falling block in the known universe. But as rounds progress, Wally will start to gain the ability to jump, push other blocks, pick up blocks and even KICK THEM BACK AT YOU! I learned this the hard way, with my last life no less. I threw a block at Wally the Walrus and initially I thought it bounced off of him and back onto me. No, that wasn’t the case. He kicked back a block I had chucked at him. So Wally the Walrus pretty much has all of your abilities by round 12. Then they start dropping more and more Wallys in. The word ‘frenetic’ was thrown around for good reason with Falling. You will feel like your brain is melting during the later levels as you try your hardest to avoid and kill Wally, all the while trying to smash like-colored boxes together. Perfect. The callback to old arcade styling. Controls are tight. Nice linear acceleration of gameplay. If this game came out in the hayday of arcades it would be one of the classics that consumed quarters like nobody’s business. 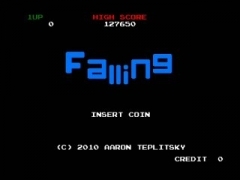 I am a big fan of Falling and hope that Aaron comes out with more games along this style. Simple synthesized music. Background music is simple xylophone beat. It’s not distracting at all and just fills the air between the other bweep’s, pyooos’, brrr’s and dooo’s. If Video Games Live has taught us anything, this is not just bleeps and bloops, but an orchestrated musical conducted by your play style. Your Igloo is under siege! Peppy the Penguin was just minding his own business. What did he do to deserve this kind of attention? Wally the Walrus is trying to get in, and he’s making a big mess, to boot! Now, blocks of ice are dropping from the ceiling, and Wally is personally making an appearance from time to time as well! Peppy was never good at keeping his igloo clean before, but now, if he doesn’t match the colors carefully and work quickly, he’ll be faced with a mountain of problems! Can Peppy clean up the mess and get rid of the intruder? It all depends on you and your reflexes! Hi-Score. Unfortunately there are no built-in leaderboards, but this isn’t the fault of YYR Games. It is a constraint Microsoft imposes on XBLIGames. Very much to the credit of Aaron Teplitsky at YYR Games, he creates a hash at the end of your playthrough with which you can submit your score directly at www.yyrgames.com/ranking. As far as I can see, Falling is a very well made XBLIG. And now the best part… it’s only $1! My Verdict: 9/10 WORTH IT.